As a homeowner, you’re always looking for more storage. You have boxes of personal belongings that are taking up space in your garage or attic, or you have a riding lawnmower that has to be parked in the garage, meaning your car cannot. Building onto your home isn’t really an option, and you don’t have any plans to move to a bigger house any time soon, so what’s the best solution? At Better Built Barns in Washington, our custom shed options can take care of your storage problems and help you keep everything organized. No matter what size of shed you need, you can add a number of outstanding features to the structure. Along with a standard entry door, you can add a roll-up garage door, making it easier to drive your riding lawnmower in and out of the building. If you’re going to be using your shed as a potting and gardening station, you can add cedar flower boxes to your windows. For the interior, you can add shelving, a lofted storage area, and a rack for all of your important tools. Depending on which model you choose, our staff can show you which features are available for your new shed. 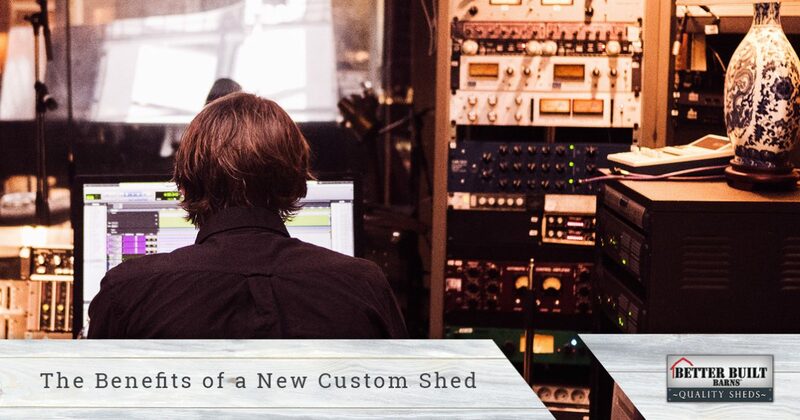 You and your spouse may have different ideas for your new shed’s purpose, and it’s important to come to a decision, even if that means a bit of compromise. You may want to store garden supplies and tools, while your spouse wants to use it as a yoga studio. Coming together and talking about your ideas regarding your custom structure can help you avoid issues later on. At Better Built Barns, we’ll construct the shed according to your specifications, but what the shed will be used for is entirely up to you! Of course, if you come to us with a specific (and agreed upon) idea of what your shed will be used for, we can recommend building and design features that will fit your vision. Not only do you need your shed to function as a suitable storage space, you also need it to look good and fit with your home’s design and architecture. We have several models available and can help you find one that fits your home’s particular design or features. You may want a classic Country Barn with its traditional red color, or a small Gable shed that fits nicely in your backyard that has limited space. Whatever the case may be, we can help you choose the ideal building for your property. If you’ve been searching for new ways to organize your home storage, or you want to get some things out of your garage, contact us today. We would love to hear about your ideas and how we can provide the perfect building for your needs. If you live in Washington, contact our Lakewood location today and a member of our team will answer all of your questions.